It’s so rewarding to throw a kids’ birthday party. Children are so naturally exuberant about their special day already, and you can take your theme completely over-the-top, if you have the inclination, time, and energy! Throwing a sixth birthday party for our middle guy earlier this year was especially fun, as I had been out of party mode for a while with the baby, and the birthday boy had finally emerged from his terrible 2-3-4s and was busy charming us again, so it felt great to celebrate him. He loves nature – it’s amazing how he will notice the smallest flower or animal and stop to point it out to us – so I wanted to do something with that theme. And I decided to do it at home, which is easier for preparing a lot of decorations and activities, as well as when there is a younger sibling’s naps to work around. A bug-themed birthday was perfect for our little nature-lover. 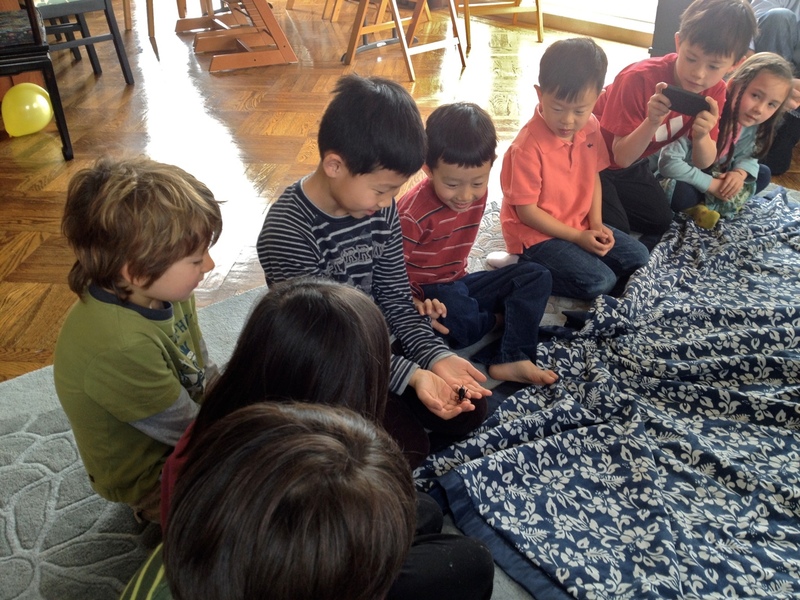 Insect Discovery Lab put on a fun show for the kids! I watched from a safe distance! In planning activities, I had in mind that I wanted to make the birthday boy a quilt. Long-ish story, but we ended up unexpectedly buying a class quilt for our oldest at the school fundraising auction a couple of years ago. It was definitely not premeditated, more like second-degree over-spending. In any case, having just bought a fixer-upper of a house, I had to tell our birthday boy that we would not be buying his class quilt this year (unless some form of auction manslaughter were to happen), but I promised him I would make him a quilt instead. I cut blank quilt squares for his friends to draw on using fabric markers, and I’ll be joining them into a quilt, hopefully some time before his next birthday! 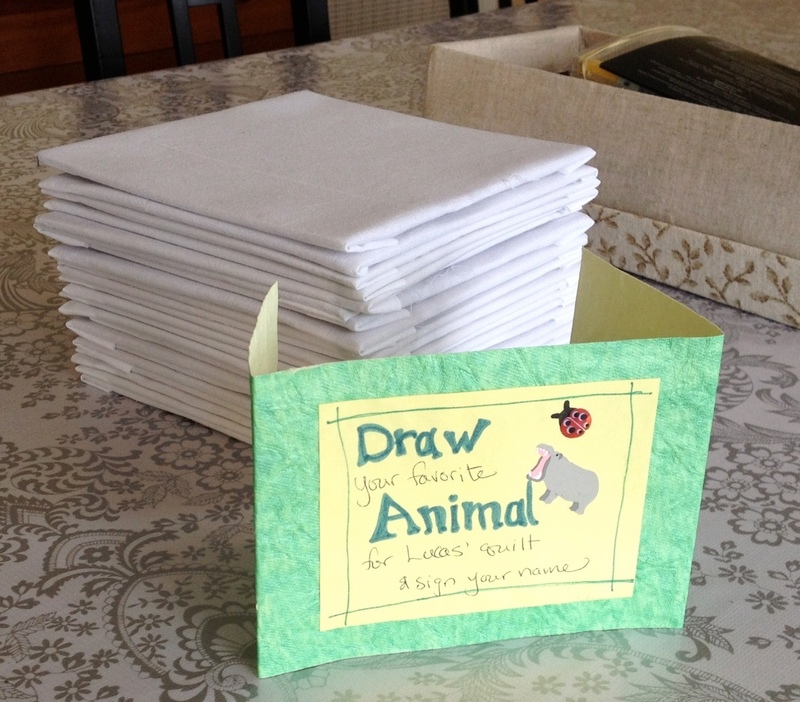 Blank quilt squares for the kids to decorate with fabric markers. 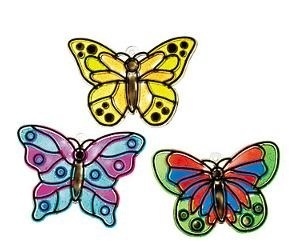 The other activities were found at Oriental Trading: we had were insect tattoos – some of the older kids helped out with this – and suncatchers. I set up the tattoos and wet towels, and some of the older kids helped the younger ones get tattoos. The suncatchers were popular but a bit messy. I later read a tip to use markers, which would have been neater, though probably not as colorful. Next time, I would put them on individual paper plates for people to paint and transport home, because the paint does take several hours to dry. Temporary insect tattoos. I provided some damp towels, and the older kids helped out. As I mentioned, for someone who works in a biology-related field, I’m pretty squeamish, and a lot of the ideas out there for bug-themed birthdays are a bit gross (think plastic bugs in food). 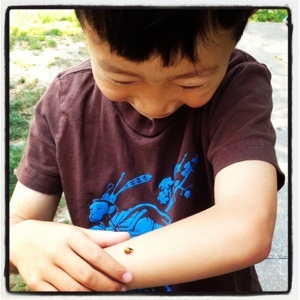 So, I set out to find ideas that were more abstract and focused on the “cuter” insects like ladybugs, while not being too cute for a six-year old boy. 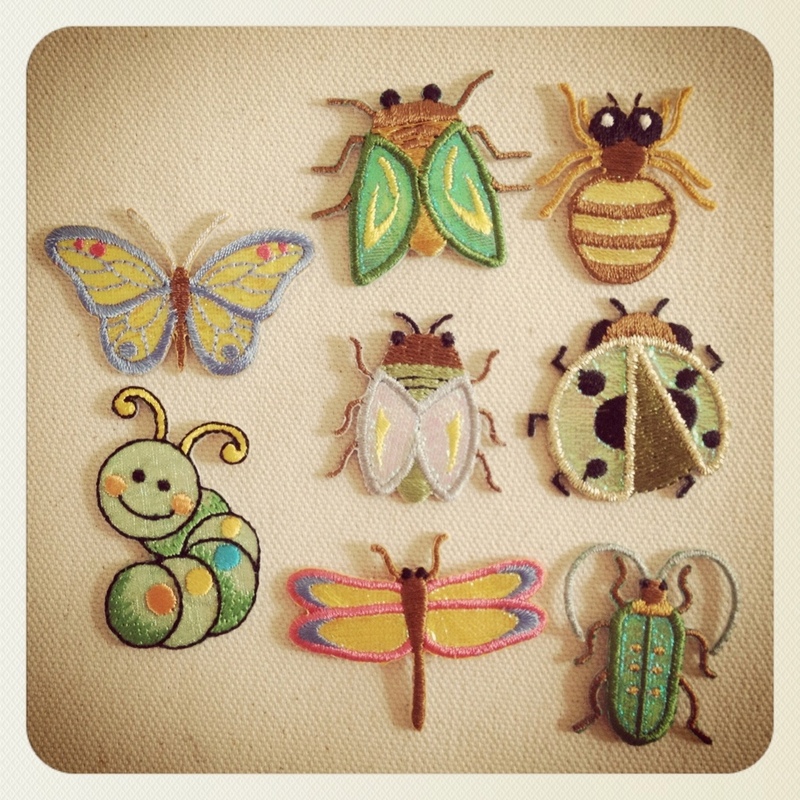 Some of the best ideas I found were those around Eric Carle’s The Very Hungry Caterpillar. It’s a bit young for the six-year olds, but it worked. 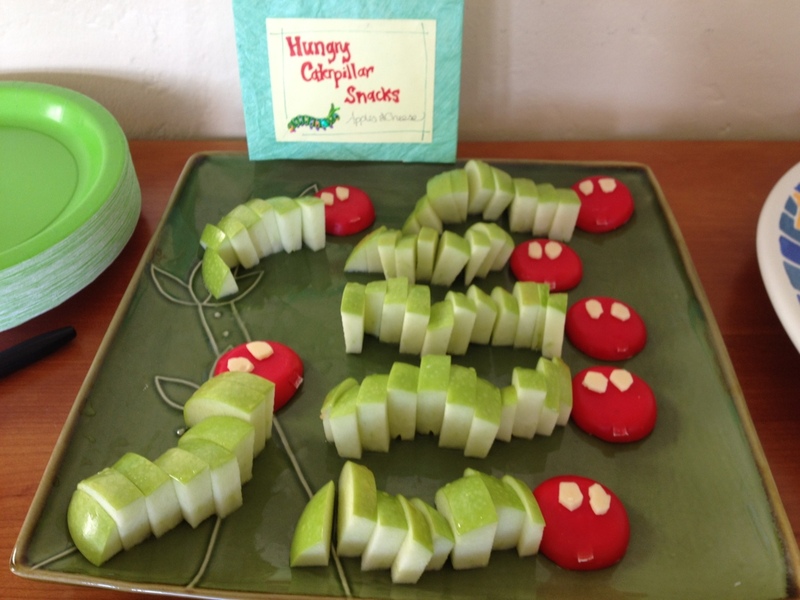 These apple and cheese caterpillars were inspired by Cute Food for Kids, where there are many more great ideas. I dipped the apples in orange juice to keep them from browning during the party. Hungry caterpillar apple and cheese snacks. The cake was inspired by a beautiful one posted at Week of Menus. I loved the look and taste of the whipped cream and fresh fruit, and it seems healthier than a standard frosted cake, even if it is still, you know, cake. I used the same idea to make a baby shower cake with a ducky for my friend. 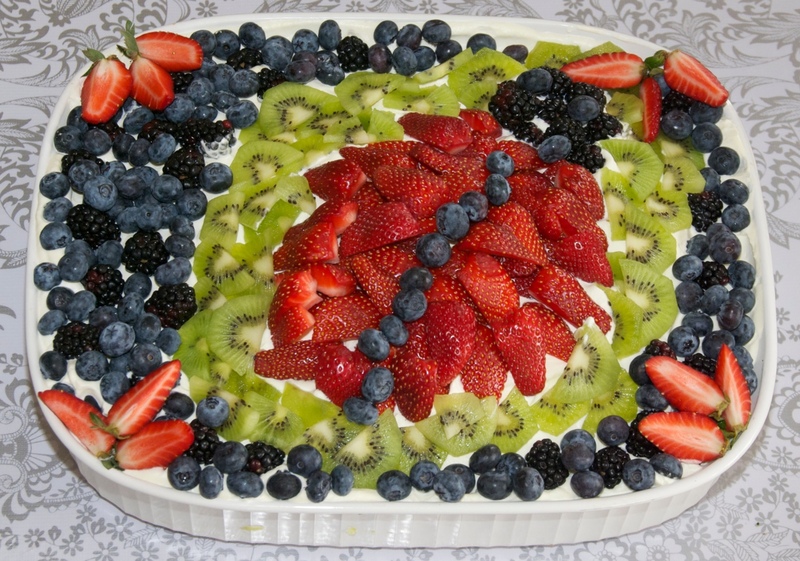 Whipped cream and fresh fruit for a bug-themed birthday cake by Jewels at Home. We also served farfalle “butterfly pasta” with cheese and hot dog-spaghetti bugs. For the treat bags, I used these cotton drawstring backpacks, also from Oriental Trading Company. I’ve done this several times, and I think the quality has gone downhill a bit in the past few years, but they still make nice reusable bags. My kids often pack their “going out” toys and activities in here, if they need to be occupied at a restaurant or accompanying one of us to work for a few hours. I used puffy fabric paint to personalize the bags and added iron-on appliques to fit with the theme. These iron-ons were adorable, but I actually did have some problems with them falling off with some wear from the kids. In the past, I used appliques made with fusible backing on plain fabric, which I outlined in puffy paint, and they held up better. 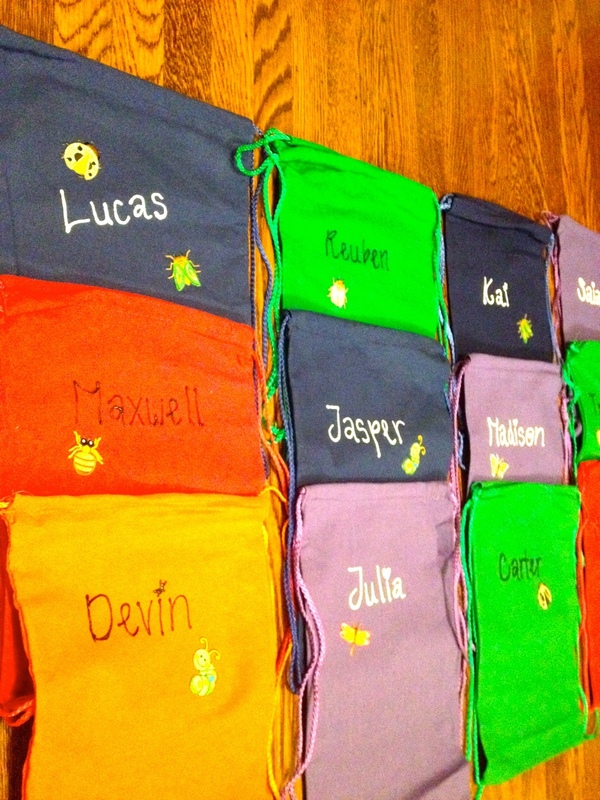 Drawstring backpacks personalized as treat bags. 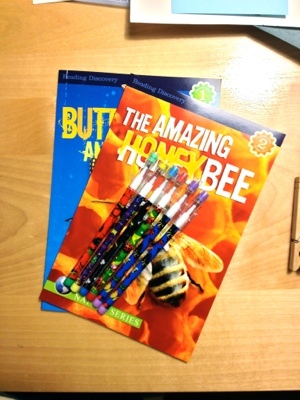 For the party favors, I lucked out and found some inexpensive bug-themed books and pencils. I also made little snack bags filled with cookies and dried fruit and pinned with a clothespin, to make the look like butterflies. I first saw the idea on this board on Pinterest. 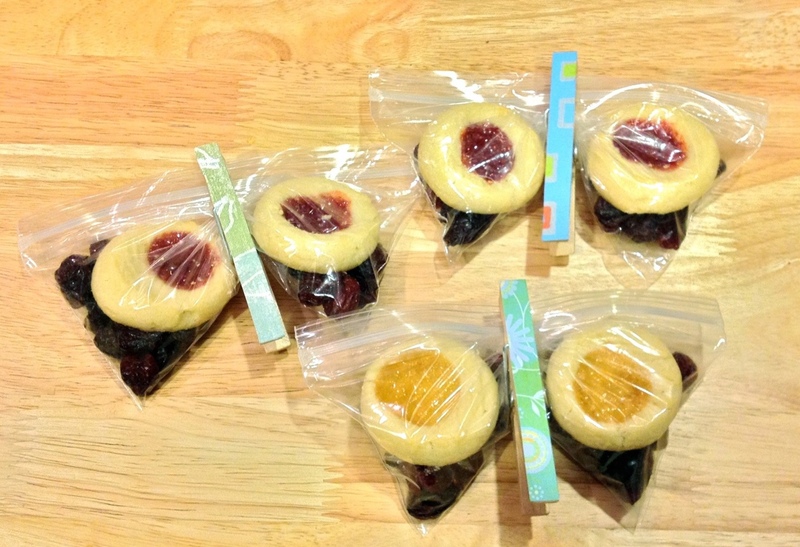 Butterfly snack bags for party favors. It turned out to be a very fun birthday party! 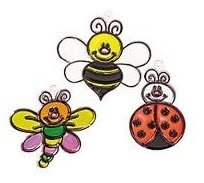 There are so many great ideas out there, and I didn’t have time to do them all, but I collected some more options on a Pinterest board that you can check out, if you are looking for ideas to do your own bug birthday party!